Wow! I can hardly believe that a month has already gone by since Peony Seed Collection Time began. I think I have harvested about all the seeds I have this year. The especially wet weather was hard on some varieties seed production. 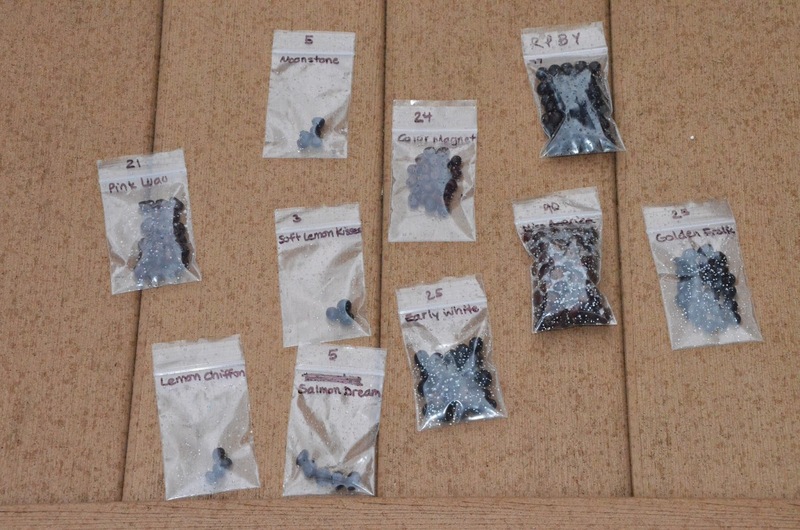 However I was able to collect lots of seed from several different varieties. I will be planting some of my seeds, and I plan to donate the rest of them to the American Peony Society Seed Distribution Program. This year I was able to collect seeds from the following varieties: Color Magnet 24 seeds, Early White 25 seeds, Gay Paree 9 seeds, Golden Frolic 27 seeds, Miss America 90 seeds, Moonstone 5 seeds, Pink Luau 59 seeds, Pink Princess 47 seeds, Roy Pehrson's Best Yellow 77 seeds, Salmon Dream 5 seeds, Seedling - Color Lavender 12 seeds, and Soft Lemon Kisses 3 seeds. This year I am going to be sure to use my copper and steel plant labels when I plant the seeds since the seedling labels I used last year had a big Peony Seedling Plastic Label Failure this spring. The plastic plant labels held up just fine, but they did not stay in the ground through the winter. So their purpose of identifying the seeds was not accomplished. The metal plant labels stay in the ground much better since they are much longer and can go deeper into the soil.